Gordon Bradshaw has posted a transcribed version of the diary of Edwin B. Weist, Company A of the 20th Indiana Regiment. The transcribed diary starts with the the regiment's camp at Falmouth and extends through several of the campaigns in which the Army of the Potomac participated including Chancellorsville, Gettysburg and Mine Run. Like most civil war diaries, the bulk of the entries describe routine duties. As I read more of these diaries, I find the typical soldier focuses on his own comfort, health and duties and knows little of the actual events. There are several entries based on rumors, such as a report that Vicksburg fell in the early winter of 1863, that would prove to be incorrect. Although he participated in several major battles, they get scant mention. The Aquia railroad gets mentioned several times in the diary. He also gives a good record of the weather they experienced, including some heavy snow. 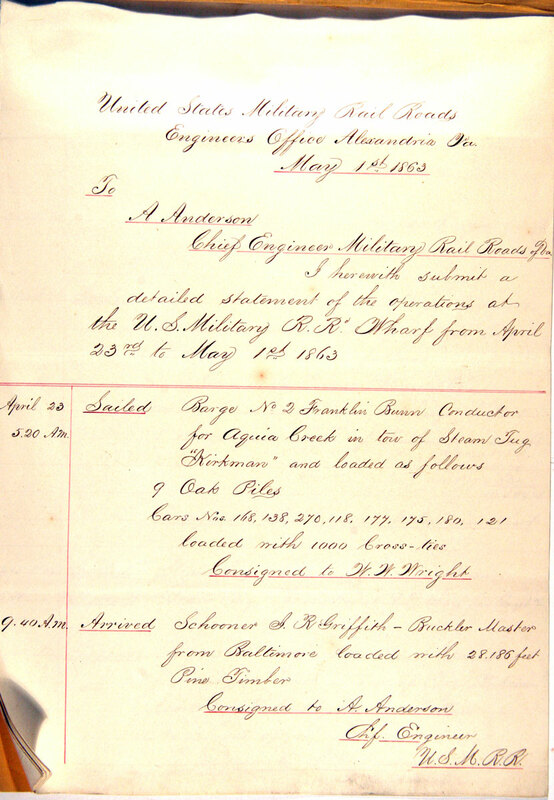 Here is a typical entry from his time at Falmouth and Belle Plain. Sunday March 8. Got a good comfortable bunk up composed of small poles covered with cedar boughs. It resembles a bed more than that we generaly have. Our camp is said to be about three mile from Bell plains landing, and about five from the old camp. The railroad is within sight, so allso is the Potomac river. We are not as much in the woods as we expected to be. Monday March 9. The weather to day has been beautifull indeed, resembling a May day. The view from the top of the hills wich surround our camp is grand indeed. The sparkling surface of the Potomac river in the distanced; the neighboring hills covered with camps; a train of cars just crossing the bridge, 75 feet high, and a regiment of cavalry on drill in the valley beneath, is a subject for a painter. Tuesday March 10. Was very disagreeable raining nearly all day, wich turned to snow in the evening. Weesner and Marsh were on detail, Mr. Thorn was sick so I have to cary all the wood we used during the day no inconsiderable job. This regiment was one of the group that got sent to New York to stop the draft riots. Along the way, the rode a number of trains. That section is worth reading if you are interested in railroad operations behind the front line. Here are some photos of the finished 1/32nd scale models of the Lincoln Funeral car. The model is posed on my O scale layout, so the tracks are too close, but the customer requested some photos on the layout. An empty ferry off Aquia Landing. Box cars can be seen on the wharf, but the loading ramp is not visible. The NARA blog post discusses a letter from Herman Haupt to Quartermaster Meigs. It is what we in the defense industry today would call a "cost-benefit analysis" of car ferry operations at Alexandria to Aquia. 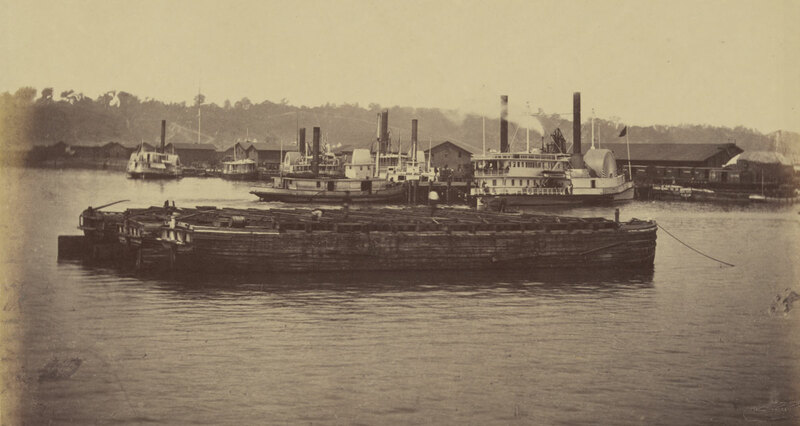 He analyzes how operating a car ferry could save money for the Union treasury. There is lots of good data in the letter. I thought it interesting that Haupt says that even with a single loading track they can load or unload the ferry in a half hour. That seems very quick to me. I suspect it actually took longer than that, and that is why the added the extra two ramps at Alexandria. There are several photos showing the triple ramps at Alexandria. There must have been a comparable set of ramps at Aquia. Unfortunately, I can find no photos showing those ramps at Aquia. Although Haupt proposes using the ferries to haul all supplies, they never did completely convert to only using car ferries. Ships continued to bring a lot of supplies direct to the wharves. The NARA has copies of the USMRR Report of Operations at Alexandria Railroad Wharf. While I did get some data from that document, my review is not complete. I did note that in most days in April they shipped one ferry a day, but on May 1st, three car ferries departed Alexandria. I need to revisit that document and completely tabulate the car ferry operation. Also this log shows that the USMRR shipped barges from Alexandria to Georgetown, Norfolk and even North Carolina. From a model railroad perspective, having both car ferries and warehouses to serve with direct-from-ship (break bulk) cargo will make the switching at Aquia more interesting. But it is fun to think that the USMRR Aquia Line could be considered the first use of containerized shipping ever. Chalk up another great idea to Herman Haupt. 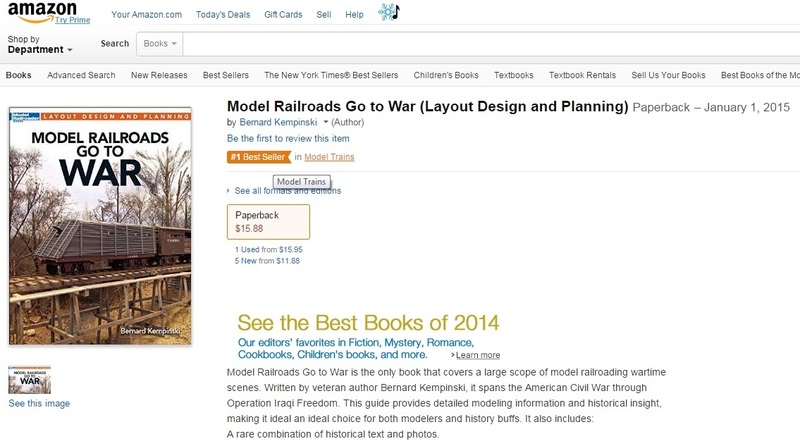 "Model Railroads Go to War" is the number 1 best seller in Model Trains Books on Amazon. The military has a tradition of hosting periodic events to welcome newly assigned members to the unit and to say good bye to departing ones. They call these "Hail and Farewells." Tonight the USMRR Aquia Line had a "Hail and Farewell." Sadly, Brian Brendel and his lovely wife Michelle are departing Northern Virginia for the Wasatch Mountains of Utah. They are moving into a dream house with an even dreamier basement at the top of Weber Canyon, just east of Ogden. It's a shame that Brian will have to walk about 100 yards to watch the UP transcontinental mainline from his new home. Brian was a force in NVNTRAK and has been a good friend. Michelle is one of the sweetest persons, and most understanding wives in the world. She also makes the most awesome cookies and cakes. We will miss them. On the plus side, we are gaining two new model railroaders to the Northern Virginia area. John Barry and Paul Catapano. Both are moving to this area from California. John plans to model the ATSF on the San Francisco Bay Area, though the exact area is not yet clear. Paul is a big time model railroader operator. He had a massive Appalachian Coal hauling rail road in his old Burbank, CA home. He plans to build a new version of it in his next house in Winchester, VA.
Also attending the event were John Drye, Joel Salmons and Doug Gurin. The boys are itching for a work session on the layout, so we plan to start back up in Feb once the next book is done. From L to R Joel, John D., John B., Brian, Paul, and Doug. My latest book, "Model Railroads Go to War" is now shipping from Kalmbach Publishing. Kalmbach has them in the warehouse now. If you want it signed, you can order from www.alkemscalemodels.com as I have copies in stock. I occasionally get requests from people to build our kits. Unfortunately I am not set up to do that myself. If you like to build kits and want to make some money, I am going to set up a kit building exchange. This will hopefully allow builders and buyers to get together. Kit builders can provide me with you name and contact info. I direct requests for kit assembly to that list of folks. It will be up to the buyer and builder to arrange terms etc. Although intended for Alkem Scale Models kits, you can do what ever you wish including other kits or jobs. I have had people ask about DCC installs too, so if you do those, we can add them to the list. I will set up the list of kit builders on my web site at the link here. If you send me your name, contact info and some samples of work you wish to show off, I will post it there. You can post your name here, or send to me via PM. I hope to get this set up in the next couple weeks. So please spread the word. The first builder has volunteered his info.